In Agile we often talk about the importance of having relatively stable teams. But is that always the right thing to do? In this episode, we explore the possible consequences of keeping the teams stable for too long. We discuss possible anti-patterns and what to do about that. In this episode, we mention the concept of groupthink and the book The 5 Dysfunctions of a Team by Lencioni. In Thinking, Fast and Slow by Daniel Kahneman Eddie learned about how people tend to think, especially in situations where quick decisions are necessary. And he considers that a key asset for change agents like Scrum Masters. The books Product Mastery and Scrum Mastery by Geoff Watts. Geoff was on the podcast back in December 2018. The book Coaching Agile Teams by Lyssa Adkins. The book Agile Retrospectives by Esther Derby and Diana Larsen. The book Lean Startup by Eric Ries. The book Drive by Daniel Pink. The book Turn the Ship Around! By David Marquet. David Marquet was guest on a past podcast episode. And we also mentioned several books by Jez Humble. Eddie is an agile coach who has been working with Agile since 2004 using XP, Scrum, Lean, Kanban & Scaled Agile. He coaches teams, scrum masters, product owners, leaders, coaches, organizations and little humans. 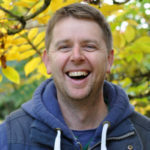 He likes teaching agile with Lego & games and is also co-founder of the LeanAgileBrighton conference. You can link with Eddie Kenny on LinkedIn and connect with Eddie Kenny on Twitter.